Marijuana has been a controversial subject for a long time. With 482 active components found in its glistering resinous flowers, Cannabis has tremendous medical potential and creative and personal benefits to offer. The most common compounds found in cannabis are THC and CBD; These components have Proven as exceptional for healing, stress relief, uplifting and other medicinal qualities for both patients and recreational users of marijuana. You’ll read everything about the process of turning your potent strains into the best homemade THC and CBD extracts and concentrates; Learn how to do it yourself and make Hash, Cannabis oil, Rosin, BHO and other various types of hash, cannabis oil and other cannabis extracts. 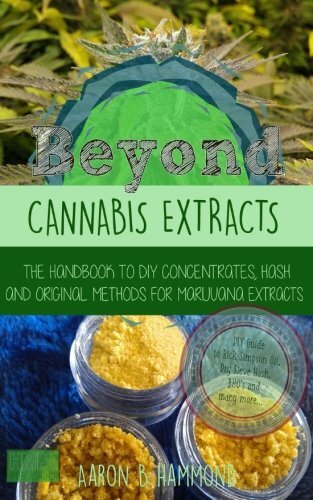 This efficient guide provides all the information that you; The Cannabis Enthusiast, Aspiring Cannaseur or Entrepreneur in the Cannabusiness needs to know about marijuana extracts and concentrates, from traditional hash making methods to the latest trends in the Cannabis Industry; they are easy to understand, step by step methods that will enable you to make these substances yourself! Grab your copy today and learn how to make these awesome concentrates yourself!